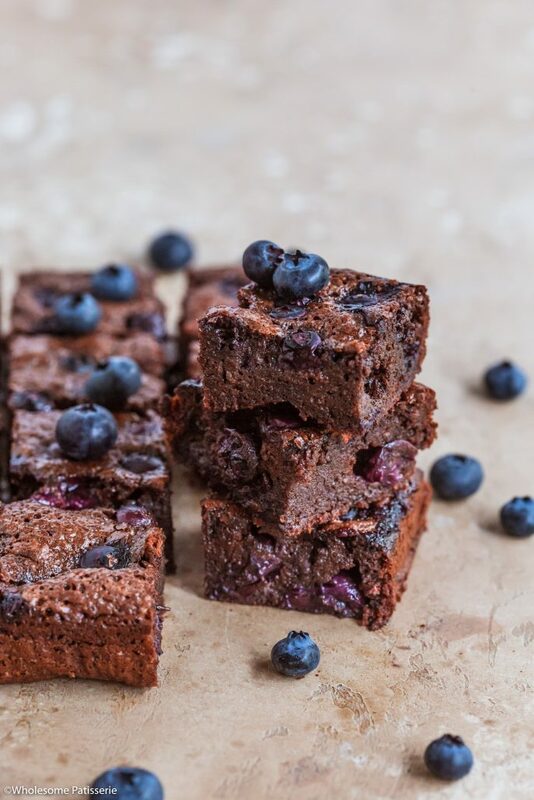 Brownies, we all love them but we need some variety in our lives and today I’m brining you one of my FAVOURITE gluten free chocolate brownie recipes filled with blueberries – YUM! Berries and chocolate are always a winner in everyones book but we aren’t here to over-complicate things. 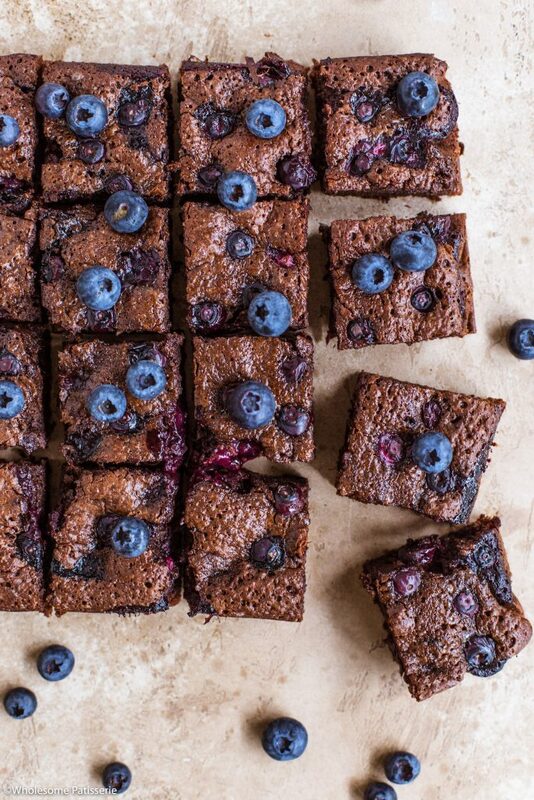 These are just your good old chocolate brownies with fresh blueberries folded through the thick luscious batter and then even more sprinkled on top, woohoo! 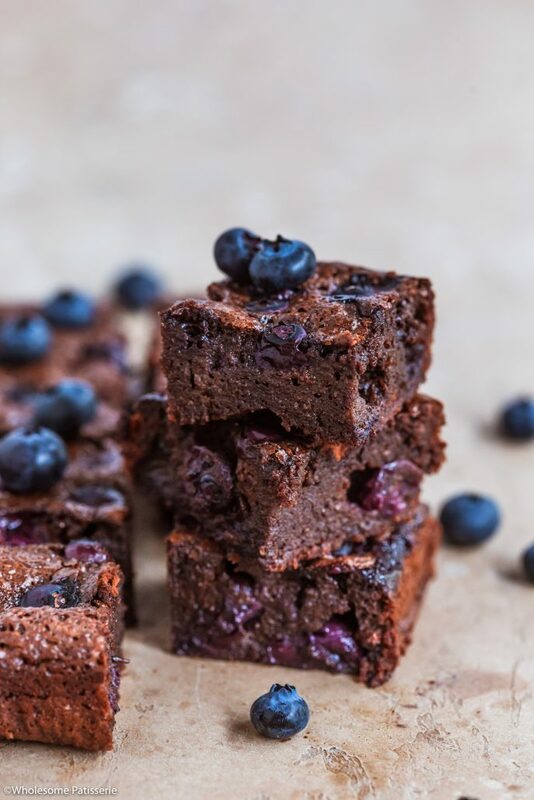 This blueberry chocolate brownie recipe is one that is absolutely perfect for you when you need to quickly whip up something that you know will last in your refrigerator and the week. A healthier snack that you can grab & go or just to enjoy over your afternoon cuppa. Who’s excited? Meee!!! 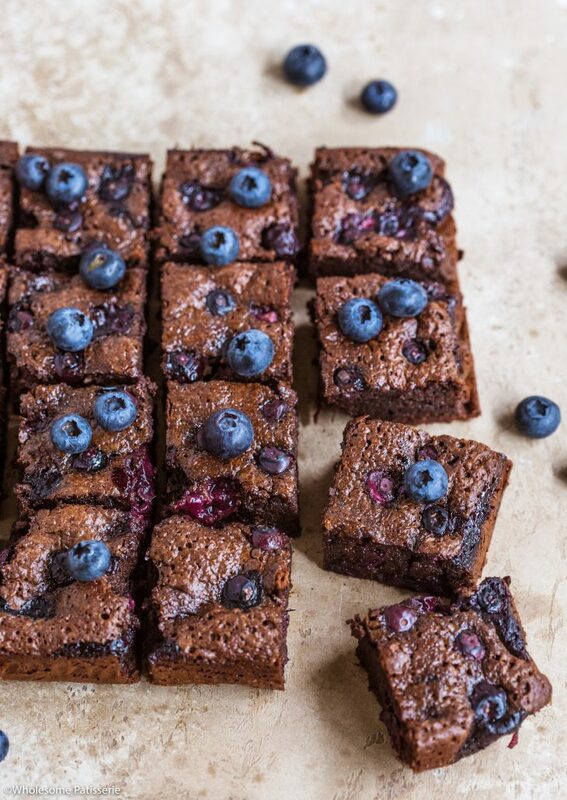 These beauties are under 10-ingredients and will be made in about 15 minutes and finished baking in 30 minutes, so does that mean you’ll have fudgy chocolatey brownies in under 1 hour?! It’s certainly looking that way! If you also don’t happen to have blueberries, you can sub them out with any berry you already have on hand, raspberries, diced strawberries or even chopped blackberries, whatever floats your boat! OK, ready, steady, LET’S BAKE! Preheat oven to 180ºC (356ºF) and line a 9” x 9” square baking tin with parchment paper, set aside. In a mixing bowl, combine almond meal and cocoa, mix well and set aside. In a double boiler over low-medium heat, melt chocolate and coconut oil together until smooth and shiny. Once completely melted, remove from heat and add sugar, whisk until sugar has dissolved. Set chocolate mixture aside to cool slightly before adding eggs, approx. 10 mins. Pour in lightly whisked eggs, mix until well combined. Add dry mixture into chocolate mixture, gently folding until just combined, do not over mix. Fold through ¾ cup worth of the blueberries (half of the quantity of blueberries). Pour batter into prepared baking tin. Bake for 25-30 minutes or until brownie springs back when touched or until a skewer inserted into the middle comes out clean. Remove and cool in pan for 10-15 minutes. Store in an airtight container, in the pantry, for 3-5 days.